I normally work from my home office where I make use of communication and sharing tools like Skype, Teamviewer and Dropbox, over and above the project management, download and support facilities on my website. You contact me or I get in touch with you – we meet and discuss your requirements. Generally, I receive a phone call or email from you requesting more information about my services. You tell me what you require and ask if I can help. I tell you that I think I can and ask to meet or teleconference with you to give me more insight into your requirement. I'll provide you with my Phase 1 Questionnaire to peruse until we meet. We meet and discuss the questionnaire and any other items on the agenda. Next, I need to see the real thing to assess time and costs. If necessary, we co-sign an NDA to protect your intellectual capital. Obviously, you want to protect your intellectual capital, so first, we conclude the Non-Disclosure agreement. I should now have access to your systems and information, which I use to develop the proposal which will contain my assumptions, my development tasks, milestones, copyright cession and last but not least, my charges. Please note that it is firstly preferable for me to have remote access to your product or a full installation on a notebook computer. Obviously, this is greatly dependent on the architecture of the product. Sometimes, the use of a VPN environment is preferred. Preliminary information-gathering is done by Afour. 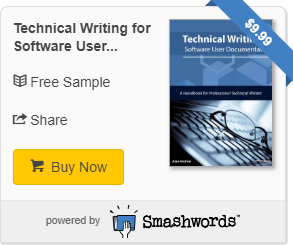 Sources may include your system and other technical or functional specifications, interviews with your subject matter experts, and/or using the product to see what it does and how it works. Concurrently, a project plan and schedule will be worked out in consultation with you, the client. Please note: All information gathering interviews and meetings will be voice recorded. This ensures that all information is captured and hopefully, nothing is missed. I submit the proposal, which will outline the scope and tasks, to you for perusal and, hopefully, acceptance. Upon acceptance of the proposal, we will conclude the development agreement by signing the proposal. At this stage, a deposit payment is required. Here we do all the legal stuff such as Proposal creation and submission, NDAs, Copyright cessions, Invoicing, Conclude an agreement. 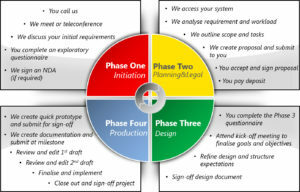 I start by requesting you to do a tiny homework assignment (Phase 3 Questionnaire), which is used to define the project's detailed objectives, such as design element requirements and expectations, business process examples, project size, flow charts, features and benefits, description of topic functionality, specific jargon and branding theme and logos. When you have completed the assignment and you must prepare to attend a project kick-off meeting either physically or by teleconference. At this meeting, I will confirm and define the business issues around the project, the objectives, and the structure. This is probably the most important part of the project, specifying your direction and objective and how you want to achieve it. That is why we need to do this part together. After a successful kick-off meeting, if required, I will meet with your subject matter expert (SME), to compile a more detailed scope and structure or script and plan visuals and interactions that meet with your objectives. This process helps design the topic structure or storyboard used to build your materials in Phase Four. At the end of Phase Three, I combine the design work (subject content, images, animations, and videos) and the standards (theme look & feel) and the topic structure or storyboard into a short prototype. The prototype gives you an accurate sample view of how your project material will look after it has been built. At this point, you will approve the prototype and then production can begin. Here we gather all the necessary information and stuff from you and put it in a prototype. At this stage the prototype is complete and the writers get involved. From the prototype and all the gathered information, I will see what information is required and what needs to be written. Creative processes are often time consuming and expensive. So much effort will go into the design, in order to ensure that there is no room for guesswork or rework. Writing the first draft for review. The draft may contain questions or comments about alternative approaches or further information required. Commenting, reviewing and editing the first draft. At this stage, the SME or other experts will usually be asked to correct any errors or answer any query, and business process experts will be asked to comment on the general approach. Writing the second draft for review, incorporating comments and, if necessary, reconciling conflicting opinions. Client will review the draft again. At this stage, comments should be relatively minor. This will continue through a reiterative process until complete. If a software product is still under development, it is of utmost importance to keep me informed timeously of all changes being made. At the end of this phase the final product will be deployed to a CD, Memory stick, Cloud, Server or Website environment, whatever your choice. The Production (writing), Review (editing) and Delivery Phase. This is the fun part, we build it, show it to you, you check it out for accuracy and correctness. If necessary, we change it, mould it, fix it . . . and we go round and round till it's done. Within limits of the scope and timeline, of course.